I‘ll show you the exact, step-by-step method that PID Tuning consultants use to get the fastest response and max stability from almost any PID control loop. Are you pulling your hair out with frustration trying to tune your PID loop using trial and error? I‘ll let you into a secret: the PID Tuning pros have a special name for that ‘trial and error’ method. They Call it "The WAG Method." That stands for Wild Assed Guess. Because if there is no science or methodology behind your tuning then the chance of you stumbling across the exact combination of P, I and D gains that will deliver the fastest, most stable response is approximately zero. Have you also tried the infamous Ziegler Nichols technique yet? You know the one - It forces you to send your system unstable before suggesting tuning constants that leave your loop always teetering on instability. How is it that a technique invented in the 1940's that rarely works outside of a laboratory (with its sterile, ideal conditions) is still peddled by almost everyone in the industry as THE way to tune a PID loop? How's your Calculus these days? Are you fed up with websites and textbooks full of equations like this?? The truth is you don't need to understand control theory or equations like that evil looking one above to successfully tune most PID loops. You don't need to plough through pages of dry text books trying to separate the academic theory from the practical techniques that you can actually use in the real world. I've learnt that life is just too short to spend your days (and late-nights) tweaking PID Controllers using an infinite loop of trial and error. I've learnt that Ziegler Nichols is a waste of time on anything but the most textbook of processes. I've also learned that if you ain't got $10K burning a hole in your pocket - you can still get your loops tuned beautifully - but you need to follow a very specific process. Funnily enough I have never seen this complete PID Tuning process in any textbook or on any website. Which is a shame because these tuning rules will give you a fast, robustly tuned loop with minimum overshoot. Do you want to see the formulas that I recommend for PID tuning? I want to be completely up front with you here. Whilst you won't find my complete, step-by-step, paint-by-numbers approach in the textbooks, if you have the patience and can decipher the highly academic style of writing, you can dig up the formulas that I use to calculate the tuning constants. In fact I'll even point you to their location. Just, please bear in mind that applying these formulas only makes up 10% of the Blueprint. The rest contains practical and essential steps that you need to complete before you should even begin to think about calculating tuning constants. The formulas used are from the Integral Criteria and Lambda Tuning Method and minimize the Integral of Absolute Error (Don't worry I use plain English in the Blueprint). The technique I'm talking about is a technique that I've assembled from lots of different sources over my 12 years as a control engineer working with some of the best Control Engineers in the world. I've used the very same technique to tune loops from nuclear power plants to chocolate factories. I have collected 12 years' worth of practical PID tuning experience and put it into The PID Tuning Blueprint. I will guide you through all the methods, principles, and hard earned practical insights of my 12 year-long journey in plain English and in a simple step-by-step way. As a highly skilled professional, you've got a million and one things that need your attention. 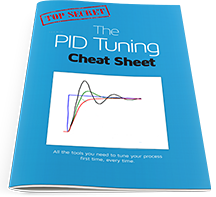 Don't waste your precious time trying to piece together the whole picture about PID Tuning when I can give you all the information you need right now. "Thanks! What you are doing here is awesome. We need more folks like you in other areas of engineering training & development." "Finn, I have just finished tuning a PID loop for an industrial refrigeration plant (ammonia) and I had to write you a quick note to say how impressed I was/am with your tuning blueprint. I followed your steps for an integrating process and used the equations provided and WOW! what a result. This has got to be the BEST tuning guide around. I am still yet to see a simpler way to calibrate and tune a loop. " "Easy to use and to follow. Probably is the best down-to-earth material for tuning PIDs that I have ever seen. Really,.. it is Idiot Proof. It is like you follow the lines painted on the floor and you will arrive safely. Using your Blueprint, my process was tuned with just PI. PID was not necessary after it was so well tuned." "We had a new control system installed with 3 valves with new pid loops. We got all 3 done with your blueprint and they are all stable over the entire operating range." "I have to say the literature that you are providing is fantastic and simplifies the whole meaning of how to control. The book gives a very structured method to tuning loops whereas other literature maintains a complexity. Seriously, I believe the direction you are heading and the information/instruction you have already given is second to none..."
"Thank you very much. This is the best thing I have ever done to improve my job performance and stay employed." Say goodbye to trial and error – this technique will give you the best settings first time, every time. This technique will automatically identify any nasty loop characteristics like time delays and lags and provide tuning constants that will handle them. So what does the PID Tuning Blueprint package actually include? 1) Digital Basic Everything you need to get your process tuned today - the full course in PDF plus the PID Tuning logbook and PID Tuning Cheatsheet (all as described below). PLUS you get the 3 fast action bonuses: "The Idiot's guide to the PID Algorithm", The Definitive Guide To Cascade Control and the Process Linearizer for MS Excel. 2) Pro Package The full Blueprint in PDF with all the extras above, plus my fully featured "PID Tuning Simulator and Tuning Constants Calculator" for MS Excel. This is PID Tuning software written in MS Excel that both hugely speeds up the tuning process and lets you learn the techniques in the blueprint on a simulation of your process. Make any beginner's mistakes in Excel - not on your plant, and be confident in your tuning before committing the new parameters to your controller. 3) Deluxe Everything I just told you about above, but all the books are shipped to you as hard copies and all the software is shipped on CD. 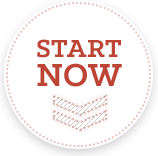 Plus you get instant downloads of the Blueprint, bonuses and software. 4) Site Licence. A site-wide licence (up to 20 users) for your site, so that every engineer and tech can have their own copy of the blueprint materials and software including the PID Tuning Simulator / Tuning Calculator. Plus 3 hard copies of each of the books and the software on CD. You'll get this step-by-step guide explaining my unique PID Tuning technique, and how to apply it to your specific process. Don't expect a Harry Potter novel here! It's 65 pages filled with only what you need to know, so it shouldn't take you more than an hour to work your way through. You can begin implementing the steps immediately. Once you've used the Blueprint to tune your first loop, you can progress to using this 2 sided cheat-sheet to quickly tune subsequent loops. The cheat sheet is a super condensed guide to the tuning process that you can easily refer to out on the plant, to ensure that your loops get tuned as efficiently as possible. 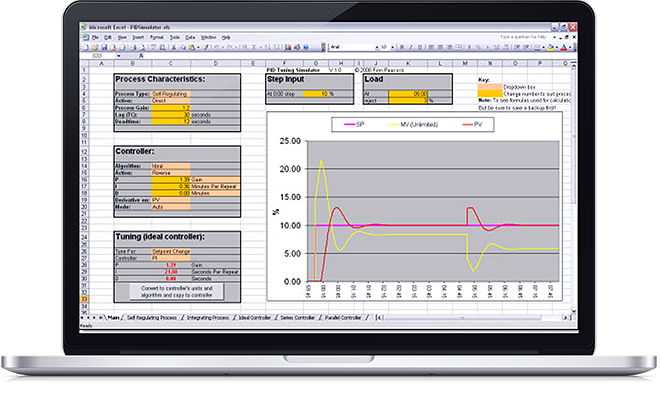 The best PID tuners in the business are those who try out their newly calculated tuning parameters on a 'fit for purpose' simulation before investing in both the effort and downtime required to implement them on their physical process. a) You follow steps 1-7 as per the Blueprint (despite what some software vendors may claim - these essential steps cannot be automated). b) You go through each configurable cell on the main worksheet and dial in your process, controller and desired performance characteristics. c) The algorithms in the spreadsheet automatically calculate your optimum tuning constants (using the exact same rules as described in the Blueprint). The spreadsheet also automates the process of converting the raw tuning constants to values that your specific controller type can use. e) You spot any mistakes in your tuning well before you touch your plant, and gain confidence in the tuning technique that you have just learned. This is also a great learning tool for playing with the controller setup and seeing how the different parameters affect the process performance. I have written this in Excel so that you have complete access to all the algorithms that drive the PID Simulation and the tuning. I hate 'black boxes' as much as the next engineer. If you want to understand exactly why something is happening in the simulation or the calculator - simply unprotect the sheet (no password required) and the workings are there for you to see. What else does 97 bucks buy you in industrial automation in 2019? A pack of 500 Ferrules? You don’t have to understand why the PID algorithm works or the calculus that underpins it to tune most loops in practice – but if you are like any engineer that I know – you don’t quite feel comfortable unless you have an intuitive understanding of what is happening and why….. 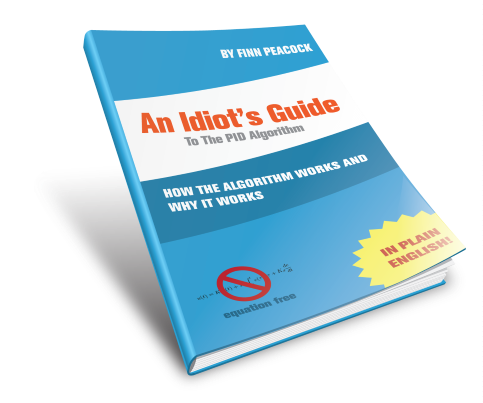 This guide to the PID algorithm and the mathematical concepts that underpin it - is written so that anyone can get an intuitive understanding of how the algorithm works and why. This crash course uses the analogy of a car on a freeway changing lanes to represent the process under control and walks you through easy to visualize "thought experiments" to cement the concepts in your mind. Now even I can explain it to others. Excellent Job!!!" "I was impressed with how the Idiot's Guide explained all of the math behind the proportional, integral and derivative terms in layman's terms, so that operators, engineers, electricians, and mechanics cold get a better understanding of PID control. The Operators and Stationary Engineers in my plant were very grateful that I allowed them to read the Idiot's Guide, because now they could understand the processes beter. I also liked the way that it built up each of the three components, starting with proportional, then adding integral, then finally adding derivative. This practical explanation helped me understand PID control better in two hours than I had learned in three-month theoretical courses that I had taken in the past." 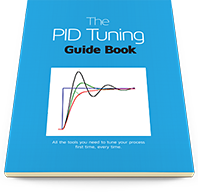 Get The Complete Idiot's Guide to the PID Algorithm today with your Order of the PID Tuning Blueprint. A critical step of any tuning process is to ensure that your process responds linearly to your PID controller output (See the Blueprint Guidebook Section 8). 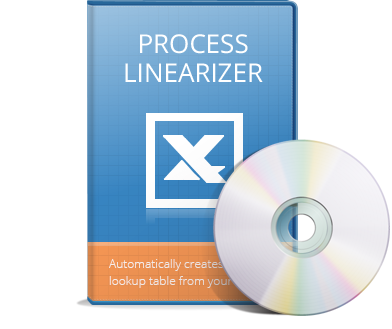 This Macro automates the linearizing process. You simply paste your process data in - and the macro works out a lookup table that you can use in your controller to hugely improve the performance of your loop. 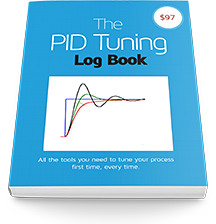 Get The Definitive Guide to Cascade Control today with your Order of the PID Tuning Blueprint. You may well know that Cascade Control is one of the more popular "Advanced" PID strategies out there. You may also know that it involves inserting the output of one controller directly into the input of a second controller (ouch!). But do you really understand why cascade control is used, when it improves loop performance and when it kills it? 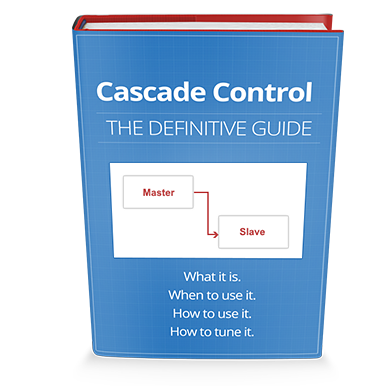 Would you like a detailed step-by-step guide that shows you how to evaluate, design, tune and operate a Cascade Control System? This definitive guide to cascade control tells you everything you need to know about cascade control so you know when to use it and how to tune it. It is 25 pages of nothing but the facts with more diagrams and examples than you can shake a stick at. I have a very simple promise to make to you. 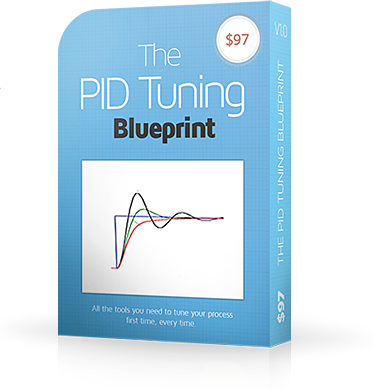 If the PID Tuning Blueprint is not everything I've said it is, I want you to ask for a full and complete refund. You've got 60 days to think about it, experiment with it, learn from it, and improve your processes with it. That should give you plenty of time to know one way or the other that the Blueprint is the critical tool that boosts your process control success. If you don't like it, or it doesn't work at least as well as I've described, you get your money back. I am so confident that this package will make you a PID Tuning Ninja that I am offering a 60 day 100% Satisfaction Guarantee. If you are not satisfied with it in any way whatsoever (even if you don’t like the color of the cover!) just shoot me an email within 60 days and let me know. I will issue a prompt and courteous refund. No hassles, no questions, no ifs and buts. The product will be delivered to you via download once your payment has been authorized. NOTE: You will need Acrobat Reader to view The PID Tuning Blueprint which you will receive in PDF format. If you don't have the Acrobat Reader software you can download it for free by clicking here (a new window will open so you don't lose this page). The PID Tuning logbook is presented in MS Word, so you can fill it in electronically and also modify it to suit your company's documentation style. The PID Simulator/Calculator and Bonus Linearizer Macro need MS Excel 2003 or higher. DISCLAIMER : Use this, or any product, at your own risk. By using this product, you agree that your recourse for any and all claims related to your use of this product is a refund within the terms of our guarantee. The Practical PID Tuning Method for Flow, Level, pH, Pressure, Temperature, Servo, Speed, Position, Cascade Control plus many other PID Loops. “Finn, I have just finished tuning a PID loop for an industrial refrigeration plant (ammonia) and I had to write you a quick note to say how impressed I was/am with your tuning blueprint. Just a quick note to say thank you - and add me to the list of the people who say WOW! I've been trying to tune a process with a long lag and its taken a long long time. Ran your blueprint, put the settings in and a process that's been oscillating continually for days suddenly falls in to line perfectly! - and at the same time I managed to work out that the HMI does not have enough decimal places to add the tiny amount of I required - hence continual oscillating! “We had a new control system installed with 3 valves with new pid loops. “Its power and utility is embedded in its simplicity. 3) Implement - It worked first try. “Easy to use and to follow. This is probably is the best down-to-earth material for tuning PIDs that I have ever seen. Really,.. it is Idiot Proof. It is like you just follow the lines painted on the floor and you will arrive safely at your destination. “In implementing the PID Tuning Blueprint, I was able to uncover instability in the glycol cooling loop. “I liked it. I felt it was well written. And yes it did help me understand loop tuning. I used it to tune a thermal process. Everything from temperature loops to level, pressure and flow. “I thought that the blue print layout was excellent, each step was clear and concise. The clear text and diagrams demonstrate the theory very well. It is nice to deal with a company that stands by their product and passes on any upgrades improvements at no charge. “It help me understand the concept of PID, and what the effect of each parameter on the output result is. “First of all I read all your Idiot's guide to PID and absolutely loved every minute of it. For crying out loud I totally understand in concept the components and their reasoning ... just love it!!! “Firstly I would like to congratulate you on the way you have laid out the guide. I have been in process control for over 20 years and have not seen a more clear explanation of the tuning process. I purchased your guide because I have been tasked with training a couple of instrument technicians on the art of vessel jacket tuning (with an added complication that my students are French!!!). I have done quite a bit of tuning over the years, though not anything like on a full time basis, and the principles are well known to me but I could not have laid out the steps in such a clear and concise manner. “I found The "Idiot‘s Guide to PID Tuning" clear, concise, and to the point. I haven‘t really had exposure to closed-loop control, however, this is a requirement in my new business, and I had to get an idea of what the hell it was. “I have gone through your idiot's guide..making me one of those ‘idiots’ who have benefitted immensely from your guide. Jokes apart, let me say thanks to you for sending me your wonderfully written tutorial which is as much fruitful to a Process Engineer as much as it is to a Control Engineer. I being a Process Engineer, was always mesmerised by PID controllers but I now I feeel I understand them fully and realise that the control engineers are no more clever than me! “I purchased your PID Blueprint Pro/Deluxe more for evaluation than for needing an introduction to PID. I have been working with PID software for over 30 years, doing various flavors of custom algorithms. The most complicated one was PID with a few strings attached: I spent many hours in simulation. Wish I would have had your spread sheet then. This one processed polymers on the NASA Space Shuttle a number of years ago. “I have to say the literature that you are providing is fantastic and simplifies the whole meaning of how to control. The book gives a very structured method to tuning loops where as other literature maintains a complexity. 1. You explain every thing one needs to understand both the theory and process of mastering PID loops. It is rigorous without being tedious. 2. Unlike most other treatments on this subject you go to great lengths to explain the ‘units’ used by different PLC's and controllers, which I have always struggled with. It‘s simple to follow, quick to use, and it works. I‘ve tried other methods with usually lousy results. I've used this method a few times and it works properly. When the client drops in ‘to see how I'm getting on’, his loop is running sweet and his jaw drops to the floor, that's a good product. “As an industrial electrician the company I‘m working for now has been my first experience with instrumentation. The Tuning Blueprint is easy to understand and use as well as being a great reference source. My understanding about PID is really getting better, thanks to the blueprint for the clear explanations, my confidence when PID tuning has been boosted. “Most control/PID literature (textbooks etc) is a mass of mathematics which bears little relationship to real life situations. Written by academics! “I was surprised at how well it worked with so little time involvement. “I was hesitant that the Blueprint would be general enough to be applicable to my PID tuning requirement, and that it would be too technical for a non-engineer, or applicable for only industrial processes. Both the Idiot's Guide and the Blueprint helped me understand what my PID controller was actually trying to do, and I finally grasped how the P, I and D components affect the controller output. I also understood the correct definitions of many of the other terms, and determined the response type (integrating) of my process. Now that I understand my process, and particularly its long lag and inertia, I have arrived at P and I parameters that provide me with the best trade-off between minimal overshoot and responsiveness. “After years of trial-and-error tuning I decided it was time to make a concerted effort to really understand pid. Your publications came up as a practical way of doing this. In my business, combustion control for boilers and industrial processes, there seems to be few people who‚ have this understanding and ability. But the idiots guide really helped the technicians and operator understand PID loop tuning.